Histograms display the relative levels of the darker to brighter tones. As the histogram stands, it isn’t of much direct use to us, since the tonality of the scene that was captured will dictate what the histogram shows us .. without a direct indication of whether exposure is correct. Some will say that a histogram should have an even bell-shaped curve, but this is too simplistic. A light toned subject against a white wall will show a much different histogram that a dark toned subject against a dark wall .. even though the exposure might be correct in both instances. For all that the histogram shows us, there is only one thing that is of direct consequence to us .. where the brightest relevant tone lies on the histogram. And I have to stress the word ‘relevant’. It is no use looking at the histogram to determine exposure if there are bright patches of sky or highly reflective surfaces .. for this will skew the histogram display in making it appear like we are over-exposing, when it fact, we might very well have correct exposure. With weddings (and portraits), the brightest relevant tone is most often the bride’s dress or groom’s shirt cuffs. So what I do is point the camera to an area that only contains the white dress / shirt, and no other bright areas. Then the most right-hand point on the histogram will be the white area. And then we can place that white tone correctly on the histogram .. and all the other tones will fall into place, whether skin tones or clothes or surroundings. There is another way to approach this, and that is to spot-meter off only the relevant white area, and place it around 1.3 stops over the zero mark on your camera’s meter display. You don’t want to zero the meter reading then, since we don’t want the white to appear as grey. We want the white to appear as white .. and that will be around 1.3 stops to 1.7 stops over the zero mark. You will have to figure out the specific value for your specific camera, since there are some differences between the camera makes. In my experience I have found I will get the best exposure if the brightest relevant area has the edge of the histogram appear somewhere in the 5th block on the display, about 1/3rd from the edge of that display. It would seem that this varies a little between the various Canon D-SLR models, so it might be necessary for anyone who wants to use this method of calculating correct exposure, to interpret and apply this idea to the specific camera being used. If I start over-exposing, then that kind of spike will start to appear. With Canon D-SLRs (that I have experience of), the blinking highlights display won’t blink yet, but the image will appear too bright. Here is the same image, but 2/3rd stop over-exposed. You can see the spike on the right-hand side. It looks different than the spike on the Canon histogram. From the above images, it should be obvious how I use the histogram to achieve correct exposure … I take a close-up view of the relevant brightest tone (some white area) .. and I place this at a very specific point on the histogram. I lock this exposure value by using manual exposure mode, and all my images taken under the same lighting *will* be correct. I’ve found this method to be consistent to the extent that I don’t use my lightmeter much any more when using flashes. While we could pull up the exposure in post-processing, you have to keep in mind that digital noise is more problematic in the shadow areas. The moment we pull up the highlights via the Exposure slider in our editing program (e.g. : Photoshop, Lightroom, Aperture, Capture One), then we also pull up the shadow areas – and hence, the noise residing in the shadow areas. This brings us to an important point – to control digital noise, correct exposure is your best first step. What should I meter off with the in-camera light meter? 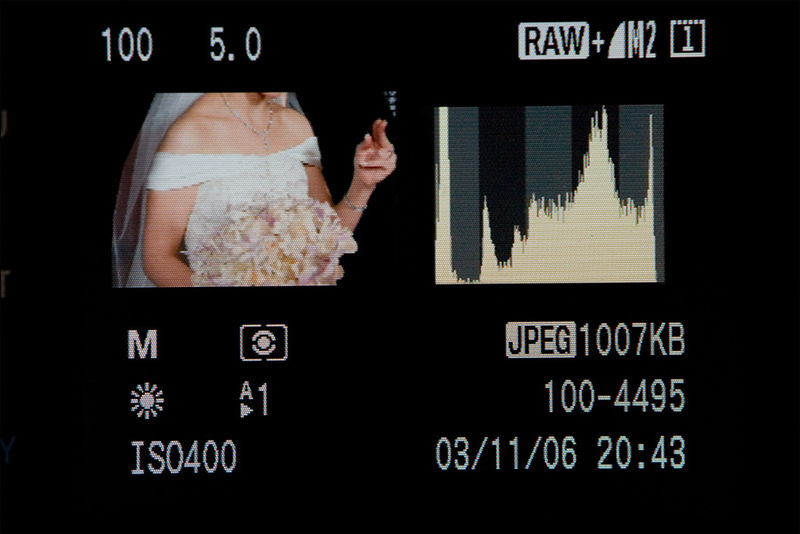 Neil, I can see clearly from the Nikon histogram where you have an over exposure, but your pair of examples with the Canon histogram seems strongly affected by the change in position of the bouquet of flowers that reduce the amount in the white wedding dress. Since the less white portion dress is covered, the remaining whites form a spike, not from overexposure, but but from a reduction of white data. I would contend that you still have a properly exposed image on the Canon at 1/100 f5.0, especially if you are shooting in RAW instead of JPEG. On a histogram, the height of the graph at any point, shows how much info there is. So a spike would show that there is *more* data, not less. I have found that using my histogram in this way, I can nail exposure nearly every time. And with RAW I have that leeway should I need it. Congratulations for your blog. 10 over 10 ! With your familly name sure you are from NL or the north of BE. Smart people from those lovely countries have a very special quality teaching confuse things into untestardable ones. No matter which topic. I am proud to tell you that I lived and work during 3 years in Antwerpen, (Berchem) 35 years ago working by Agfa-Gevaert in Mortsel. I was doing similar things with manual metering mode or by adjusting exposure compensation with aperture priority mode, but your techniques gave me for the first time a clear and practical principle which saved me from my fuzzy method. I am curious now. If I may describe your technique as a “high key” metering, do you use a “low key” metering technique, if there is, when you want black to appear as black as far as possible? How would you adjust by looking at the histogram or that’ll always require us to dial the exposure compensation as per experience? Hi Neil , I am also from SA , living in New Zealand now . I want to take control of exposure by going manual and this has been a very useful instruction for me . Great site, and I like this technique. I see how it can be very useful in controlled settings such as the studio. But, how do you manipulate this fast enough to keep up with the fast pace and ever changing lighting of weddings, especially outdoors? Is there a different technique you use for that? If so, please share. Great tutorial, helps me a lot with achieving the correct exposure. However I too would be interested in how you use this technique in Candid shots when you are moving around frequently. Hi there Ross and George – I shoot in manual exposure mode nearly always, and adjust my exposure on the fly. It comes with practice. But I also make it easier on myself with certain types of shoots, for example outdoor portrait sessions – I position my subjects so that they are in a consistent light. So if the light doesn’t vary much, it means I don’t have to adjust continuously. I get my settings, and then I shoot. Just returned to SLR photography after a 20+ break!! My wife bought me a Nikon D40 and after buying a bounce head flash I realised how much things have progressed in that time (apart from myself of course….). I was do relieved to find that your site contained superb advice that was easy to understand and put into practice – from a feeling of unease at all of the technology at my fingertips I suddenly feel like “I can really do this! !” – many thanks! WOW!! I keep saying it from your posts in Canon Digital Photography FOrums and now that I have had a chance to read more detailed print from you… I am even more in awe! THANKS for the time you have spent explaining so in-depth and yet UNDERSTANDABLE examples and instruction!!!! You have given me HOPE! THAT is priceless! Thank you!!!! I tried your technique. I set my camera to 1/1000 F3.5 ISO 200. But, as soon as I switch on my SB800 to add some fill-flash, the shutter speed goes down to 1/250. I would assume that this is because of the max synch flash. In this case what do you do usually. Shoot anyway or make adjustments? >Martian, I wouldn’t just shoot when the shutter speed drops with your flash switched on, because that would mean your ambient light would now over-expose. Rather -since you know that the camera will default to maximum sync speed – find your initial correct exposure at maximum sync speed. Or, find your correct exposure first, and then count how many clicks it takes to get to max sync speed, and then adjust your aperture and / or ISO by that many clicks. Neil – I struggle with this concept in theory. Shutter 1/1000 signifies that there is a lot of light around, so taking it down to 1/250, while I would need the F3.5 for its DOF, and the camera can’t do less than ISO 200 – would over-expose – now what about fill-flash? Firstly, let me offer a huge thank-you for the most informative site I have yet to find on the net. Your level of generosity and professionalism is beyond measure, not to mention your considerable skill and eye for photography. With regard to outdoor photography *in* harsh sun (where there is no option for shade) I often find that I blow out parts of the hair and face (if facing slightly side on to the sun) while maintaining good exposure on clothing etc. If I compensate down for this (by adjusting my aperture) then use direct fill flash (Nikon gear) on the subject my background will be very dark and my subjects have an obvious flash look. I find that if I reduce my flash output down 1.3-1.7 (in this circumstance only) that I cannot get a decent exposure on the dark side of the face (where the sun isn’t) as I have set my aperture to accommodate the harsh sun on the bright side of the face and hair. Is this just a matter of living with the blown out hair or the “flashed” look if there are no options for shade? Thanks again for all of your help. BTW, when can I get your book? Hi there Allan .. thanks! Those are the limitations if your subject is half in shade and half in sun … accept a hard flashy look, or use off-camera flash with a soft-box (or similar). It’s been mentioned on various internet discussion groups that the in-camera histogram represents the JPEG histogram rather than the actual histogram of the RAW. Several methods have been discussed about how to make the in-camera histogram match closer with the RAW dynamic color range. Some involve changing the Nikon Picture Control settings so that contrast and saturation are dialed to their minimums. Another solution involved loading a custom color curve into the camera. From your blog posts, I believe that you are not bothering with any of those solutions. If that is the case, is your Nikon Picture Control set to Standard (SD), which is the default setting? I notice that if I set the Picture to Vivid (VI), the in-camera histogram shifts, which throws me off when using the histogram technique. Stephen .. all of that is very likely .. and yet, (I believe), not hugely important during an actual shoot. Especially so if you shoot in the RAW format, you have a fair amount of leeway. So I think this is one of those things again where it is easy to over-think it and get bogged down with the minutia .. instead of concentrating on creating good images. I keep my cameras to default / standard settings; shoot in RAW; and then adjust as I feel is required during post. Much simpler. Thank you for an incredibly helpful blog. Do you have a preference for shooting in 12 bit or 14 bit RAW?. I know that theoretically 14bit will give give a much greater tonal range but in practice do you find this necessary?. I am wondering if the benefit outweighs the bigger file size. Neil, I chose 12-bit depth over 14 bits (for now). However, there is this careful analysis by Bob Johnson that show that using 14 bits give slightly better shadow detail. How can you “place” something on your histogram? 1) Follow his framing technique for checking exposure and take a shot. Review the histogram. 2) If the right side (the highlights) are too far left or right of where he likes them to fall, he adjusts his shutter speed, or aperture, or exposure compensation to “place them” further left or right to just where he wants them. thanks, this is so helpful. I can’t wait for your next SF Bay area workshop, I’ll be the first to sign up when you announce a date! I have a question about this process of metering. About how far are you from your subject when you are metering? Are you at the distance from which you plan to take the shot? Or do you move in closer to meter? That is the one thing that still stumps me… how far away to meter from. Thanks! Dana … it doesn’t matter! As long as you don’t block the light falling onto your subject, then your distance to the subject doesn’t affect the exposure .. and hence won’t affect the metering of a specific tonal value. You might have to go to spot-metering to make sure you only meter of a certain tone .. but your distance to your subject has no effect on the metering. I sommer smaak your book and site ek se!I am a Rhodie/Zimbo. I have a Canon 20d. I am using Vivitar 283/5 flashes. Is it possible to use the on camera flash to fire a slave? I have tried but find the camera’s brain adjusts the exposure. My days in Africa have made me tight-fisted(or cheap). Are Vivitar and Sunpak dedicated flashes any good? They certainly put out a lot of light for the money. The problem you’re having is that you can’t use the histogram to determine correct exposure before-hand and then repeat it for all other photographs, as you could with ambient light or manual flash. This is because TTL flash varies in exposure depending on your composition and the tonality of the scene. You set your camera on M and choose Spot-metering. 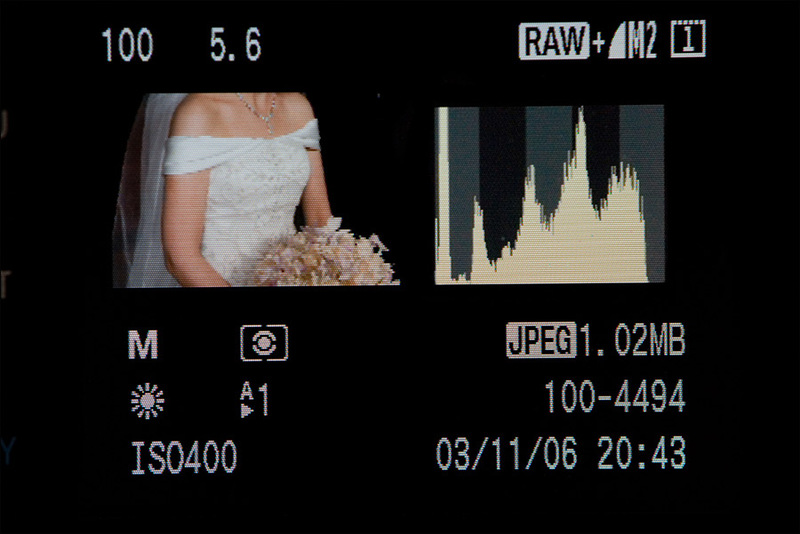 Take some photos where you meter the white dress, and place your histogram by changing the aperture/shutter/iso. Is this how you do it ? If you then want to add some flash, how do you control the flash from adding too much light to the subject ? Does your book cover the use on non-dedicated auto exposure flashes (vivitar 283 etc)? Do your methods require a TTL dedicated flash? I’ve been playing around with using spot metering and the zone system for getting the exposure correct for white clothing. I had a white shirt hanging up in direct sunlight and metered onto it’s brightest part, I then added 2 stops (in Manual) and took some test shots; no flashing highlights. I played with other exposures to see how far I could push the D3 until it started to blow out the highlights (I could get to +3 stops but the image was over exposed in my opinion). Anyway, I brought these images into the PC and view them with BreezeBrowser, the histogram was the same as displayed by the camera, all good. But when I imported the same RAW files into Lightroom the histogram was different and images that showed no blowing out in the camera or breezebrowser were suddenly having problems. A simple bit of recovery adjustment cleaned this up but I wonder if you have experienced this yourself? This happens in any of the camera calibration settings. Your opinion would be appreciated. Hi Neil, I found that the histogram on my camera is slightly differtent than in Lightroom. I shoot everything in RAW but I was told that the histogram on any camera is always showing a JPEG histogram because the camera can’t show the RAW file as a preview. So the picture and the histogram on the camera are always a little bit differtent from the RAW file. What’s your opinion about this? Alwin, read my July 25 comment to Stephen about this topic. Please tell me how many CLICKS over the 0 mark is 1.3 / 1.7 stops – I’m on 1/3 increments. Count the clicks on your aperture dial or on your shutter speed dial (or both), or even your ISO setting. Thanks, but when you refer to 1.7 stops – how many clicks is that? I believe that would be 5 clicks, total. The meter center is 0. each full stop is generally represented by a vertical line, as such: | and each 1/3rd stop by a dot. so..
your 5th click over would then be 1.7 (or 1 2/3rd) stops. Anybody is welcome to correct me if i forgot something. Lance, yes – it makes sense that 5 clicks = 1 2/3 stops, but how does that amount to 1.7 stops? Thanks for explaining nevertheless. [1.7] IS [1 2/3] stops. same thing, different notation. Today I had on my hands a camera Canon Powershot SX-10 IS and I could see that this has a live histogram. For me it was very interesting to see the histogram before the shot and I wonder why this type of histogram is not implemented in the pro cameras and semi-pros? Alfredo, I do believe it has to do with the limitations of the way that D-SLRs are designed, based on the reflex mirror. But I am sure it’s a next logical step for pro D-SLRs to have this feature. im a newbie and i find your site very helpful for a rookie like me. question: when you say “the brightest relevant tone” is it just any color which is the brightest? if there is no white what should be your next option where you can spot meter? >JM .. this is where a bit of common sense has to prevail. A bright tone, even if non-white, will still work. SInce we’re shooting RAW anyway, we have a fair amount of latitude even if we misjudge the brightness of the tonal value a little. If you have no white area to meter off, you can always supply it in the form of a napkin or handkerchief. May I just say, that every time I visit your site I always find something, that inspires me and teaches me something new in the way I can take advantage of my camera. Shooting subjects with a lot of white in them has been a bit of challenge and now I do get more understanding of what I can do, to improve my technique. Love the site, love your book. Tons of useful information. Thanks for sharing. I tried the histogram method and I found out that if I use the ttl and manual exposure mode, i am limited to flash compensation value in regards how much i can move the white point on the histogram. I could also use the aperture but in my experiment i am starting with the lowest aperture value and sync speed. I photograph the white towel with ttl on and it landed little bit to the right of the middle of the histogram. So with my d90 i changed the flash compensation to +1 (this is max) and I was able to move it little to the right, but there was still little room to move it more to the right , but i was limited because of the max flash compensation value. So assuming that in nikon the white point should be moved a little more in my picture (for the brightest relevant tone) the only that is left is the raw software that will allow me to change the exposure value? Bart .. since TTL is an automatic metering mode, you can’t use the histogram to determine specific exposure like you can if you were using (constant) available light, or manual flash. Then you can use the histogram to confirm you have accurate exposure. This is based on the idea of looking at your brightest relevant tone. With TTL flash, your exposure will vary depending on your composition, or depending on how much white or black you include. So you can’t use the histogram to pre-determine exposure .. only to confirm afterward. Now, with your observation that you ran out of FEC to adjust the TTL flash … this makes me think you were in TTL BL mode and not TTL mode. If you want to do the same experiment again, try it with the flash set to TTL mode. Hi Neil, first of all thank you very much for this excellent site and sharing your experience with us. I have a doubt, You said to over expose 1.3- 1.7 in the camera. Is it right to over ride the FEC 1.3- 1.7 instead of changing the camera setting. I just love your work! But I have been having trouble shooting RAW. I love the option of RAW when editing and such but for some reason on my Nikon D700, when I shoot RAW, and nail my exposure, when I open them in Lightroom, they always look contrasty, off in color (mostly too yellow or green) and too bright. I even took a picture with Jpeg and then again with RAW and my Jpeg looked so much better than my RAW file. Is this normal for RAW in NIkon? I thought maybe it was my computer but my Jpegs don’t look that way. I want to shoot RAW but when I see them on my computer they always look off and it takes me longer to fix it than to just shoot Jpeg and nail it in camera. Hi Neil. This is a very helpful blog. Thanks so much for posting. I have just come across it. I’m away at work now and won’t be able to try it for a couple of days but I will certainly give it a go. Have you found any “sweet spot” for the histogram with the 5D2? I shoot RAW so it might not be much of a worry as long as the highlight isn’t blown. Also can I just clarify ( I’m a Canon 5Dmk2 user) about the Canon histogram. As soon as a “spike” appears that means that you have gone too far with your exposure although it won’t be blown unless it crashes right into the edge. This is right isn’t it? 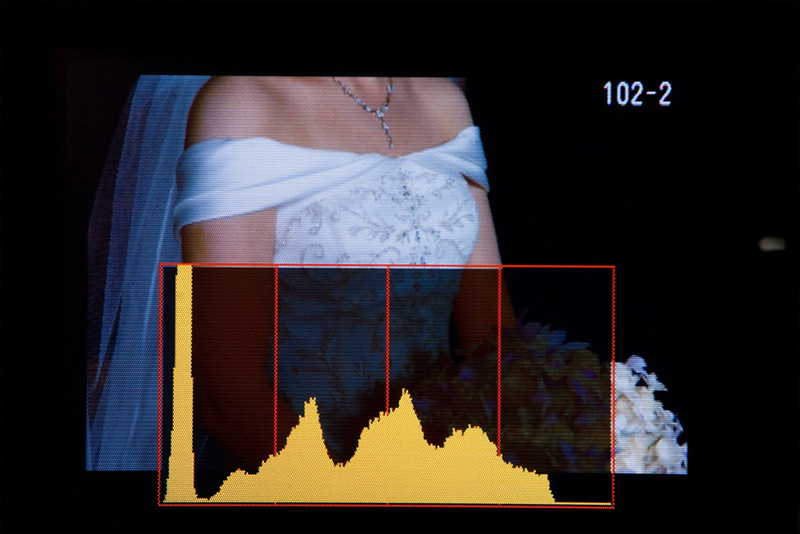 Also is there a different technique for reading histograms when the scene is very dark and “low-key”, and much moodier with few highlights such as the bride’s dress? Sorry I meant also to say that one of the reasons I was asking was that for us RAW shooters, there is the option of exposing “to the right” as well and I wondered if you were an advocate of this or not. If not then would you have a different technique for metering a dark scene with a histogram? Ok, stupid question but here goes: I am not sure which histogram above is our goal. 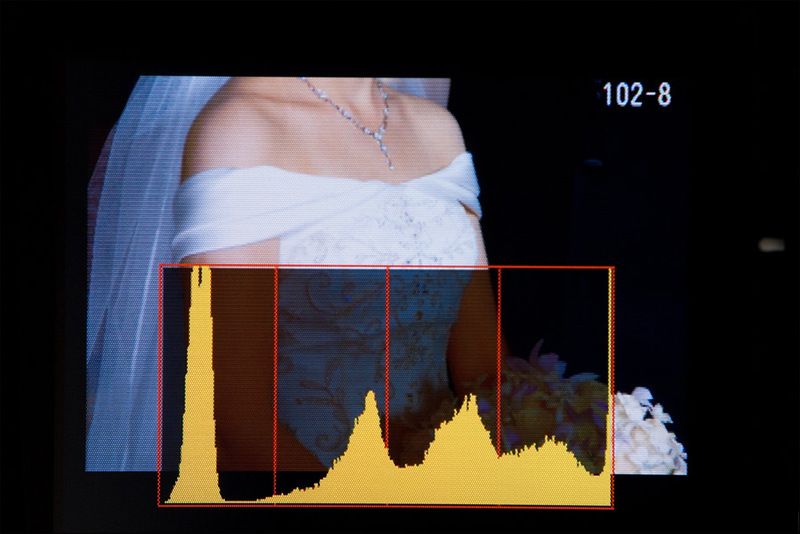 In the Nikon example, do we WANT the second histogram with the clipping on the right side? I get the impression we do, but when Neil writes that the second image is “2/3rd stop over-exposed” it makes me wonder what he means, i.e., is the second shot “over-exposed” yet correctly exposed? Tom .. in this case, where we have ONLY relevant tones in the image (ie, now super-bright backgrounds, etc), then we want the histogram to dip as close to the corner as possible … for any white tones. No clipping. Thanks for replying so quickly, Neil! Just so I understand (and apologies for being a bit dense!) the second Nikon histogram is indeed the preferable one? I usually try to avoid seeing a spike on the right side (as in the second histogram) and would instead likely aim for something closer to the first histogram. But then I don’t really know what I’m doing, which is why I’m asking the pros! The second picture where the histogram spikes is bad for this image, because you start to overexpose the bride’s dress (which is white). You generally want to be able to see details on the bride’s dress, so you want to avoid overexposing it. Overexposing the bride’s dress washes out details. Thank you, Stephen, I think I understand that bit now. Time for stupid question number two: when using this method of metering (i.e., placing the brightest relevant tone appropriately near the right edge of the histogram) I assume I should not be firing my speedlight, correct? If so, is this method intended for times when one is using only available or otherwise constant light such as studio lights? Tom .. you need constant light, whether ambient light or manual flash. You can’t use this for TTL flash, except as an after-the-fact check to see if your exposure was correct. Thank you so much, Neil! I am working through your on-camera flash book and finding it extremely informative if a bit of a steep learning curve for someone at my level. I’ve suddenly been asked to take some shots of a wedding at New York’s City Hall in just a few days time, as a favor for a couple of friends. They’re not expecting pro-quality work by any means, but I aim to do my best for them, so I am trying to learn what I can in three days time (gulp!) I guess I’ll find out how well I can handle my D90 and SB-600. 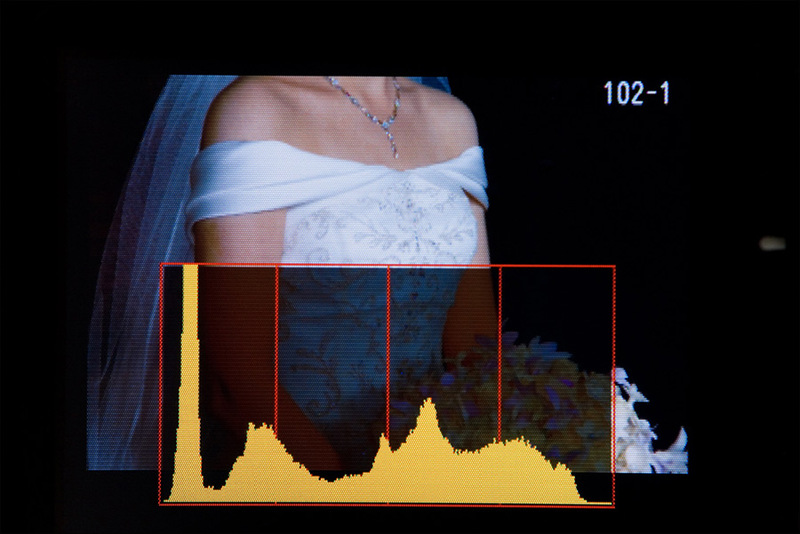 As we meter white dress for a bride and adjust it on histogram as to how much needs to be overexposed . I have one question as how we adjust if the skin tone of the person is at extreme levels( too dark and very fair). Aditya … you don’t “over-expose” the white dress. You expose correctly … by shifting the exposure value up. In the viewfinder, you’d look at the exposure meter, and take it to around 1.3 stops up from zero .. the brightest relevant tone, ie, white. Not over-exposure, but correct exposure. You can’t do the same kind of judgement for darker skin tones when you use the histogram. Not with the same accuracy you do for white, anyway. Neil -when you say “1.3 stops up from zero” – do you mean towards the left from the 0 – is this my a-ha-moment? Up from zero = to the positive side. With Nikon cameras, this is often to the left. But it could be to the right on the newer cameras. With Canon this is to the right. So I can’t tell you to which side it is. But it has to be in a positive direction, and YOU need to read your camera’s meter to interpret this correctly. I’ve just bought your book. I absolutely love your site and how you explain things. I’ve got problem with one thing. I haven’t found it yet on your website so that’s why I’m asking. In understand the technique with putting “the brightest relevant tone” in the histogram so everything else falls into place… but what if there is no WHITE in the scene? How do we shape histogram in that case?? You can always add a white object to what you need to be metering off. A paper kitchen towel. A white T-shirt or napkin. Alternately, use a handheld meter. Thank you Neil for all of your tips on this site, especially this one. This truly opened my eyes on proper metering technique. Changed completely the way I shoot, and of course this opened up the world of flash photography too. what about the situation, when you meter white dress in shady room, and lets say, you don`t have flash, ambient light is rather weak. You use same technique (pure white dress) or adjust your exposure (darken a little bit) to that weak ambient light ? In other words, because the light levels are low, you are purposely under-exposing … but with the hope that it will be proper exposure? Yes, so my question is – does your proper exposure means that in this case, white dress is white on histogram or little darker , because of dimmer ambient light ? You will have to think this one through on your own. You have all the info. The histogram image is based on the in-camera JPG, but so is the image you see on the LCD. This would still give the histogram method a more specific baseline than just eye-balling the LCD. Even with the potential discrepancy with basing exposure metering on the histogram, you still have the leeway of shooting in RAW … and the histogram would bring you really close, if not bang-on. Thanks for the information on metering the relevant white value in a scene, then opening up approximately 1 1/3 stops to have the whites remain white, instead of gray. Questions. Lets say I’m photographing the bride. I take the above mentioned steps, to get proper exposure on the relevant white (dress). When I attach a flash and shoot in TTL, what will happen? Will I get an entirely different exposure? If you are using TTL-BL or the Canon’s TTL flash in Evaluative mode, then you should be fine … the camera will figure out you need just a touch of fill-flash, and adjust the flash output down, accordingly. On top of that, the camera will see the white as being bright, and will bring the TTL flash down anyway by around a stop. Thank you for a great number of interesting articles on this web site. I have a question regarding placing the relevant white area around 1.3 stops over the zero mark. This works fine, but it makes me wonder: wasn’t the zero mark supposed to be Zone V, and wouldn’t that make 1.3 stops up from there Zone VI-and-then-some? That’s supposed to be considerable brighter than middle gray, certainly, but not white. Of course we want white with some structure, but that would be well into Zone VII. Is the theory wrong, or am I overlooking something? Thanks for your time! The amount of adjustment may depend on the dynamic range of the individual camera. i’ve seen some people say they over expose by 3 stops to get white with detail but my camera would be 2 stops max. Hiram … that would be the classic way of explaining the Zone System for B&W images. For color, and for digital, we have to adapt that line of thought. And here we are – the same thought-process to get us to a consistent way of exposure metering for tonal values. Thanks again. It’s trial and error, then: nothing wrong with that. Not really trial and error – using the histogram like this gives us a specific exposure metering method. The only trouble with the histogram method is that you have to take test shots & ‘moments’ are lost. 99% of the time i’m in spot metering & telling the camera the tonal value i want it exposed at via exposure comp & exposure lock, it obviously takes some practice but also means no need for test shots.